Own Guardians Of The Galaxy - Awesome Mix Doormat from Deff, DVD, Blu-Ray & 4K Video Specialists - Free UK Delivery..
Own Guardians Of The Galaxy - Baby Groot Mug from Deff, DVD, Blu-Ray & 4K Video Specialists - Free UK Delivery..
Own Guardians Of The Galaxy - Comic Mug from Deff, DVD, Blu-Ray & 4K Video Specialists - Free UK Delivery..
Own Guardians Of The Galaxy - Comic Panels Mug from Deff, DVD, Blu-Ray & 4K Video Specialists - Free UK Delivery..
Own Guardians Of The Galaxy - I Am Groot Mug from Deff, DVD, Blu-Ray & 4K Video Specialists - Free UK Delivery..
Set to the all-new sonic backdrop of Awesome Mixtape 2, Marvel Studios' Guardians of the Galaxy Vol. 2 continues the team's adventures as they traverse the outer reaches of the cosmos. The Guardians must fight to keep their newfound family together as they unravel the mystery of Peter Quill's true parentage. Old foes become new allies and characters from the classic comics come to their aid as the Marvel Cinematic Universe continues to ..
Marvel studios' Guardians of the Galaxy Vol. 2 continues the team's adventures as they traverse the outer reaches of the cosmos. The Guardians must fight to keep their newfound family together as they unravel the mystery of Peter Quill's true parentage. Special Features Bonus Round: The Making Of Guardians Of The Galaxy Vol.2, Guardians Inferno Music Video, Gag Reel, Deleted Scenes, Audio Commentary, Play Movie With James Gunn Visionar..
Guardians Of The Galaxy: From Marvel, the studio that launched the epic franchises of Marvel's Iron Man, Marvel's Thor, Marvel's Captain America and Marvel's Avengers Assemble, comes an unlikely team – the Guardians of the Galaxy. The Marvel Cinematic Universe expands into the cosmos when brash space adventurer Peter Quill steals a coveted orb and becomes the object of a relentess bounty hunt. To evade his enemies, Quill forges an uneas..
Own Guardians Of The Galaxy / Guardians Of The Galaxy - Volume 2 DVD from Deff, DVD, Blu-Ray & 4K Video Specialists - Free UK Delivery..
From Marvel, the studio that launched the epic franchises of Marvel's Iron Man, Marvel's Thor, Marvel's Captain America and Marvel's Avengers Assemble, comes an unlikely team – the Guardians of the Galaxy. The Marvel Cinematic Universe expands into the cosmos when brash space adventurer Peter Quill steals a coveted orb and becomes the object of a relentess bounty hunt. 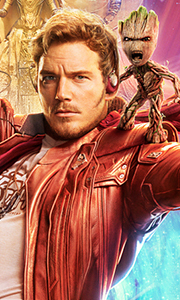 To evade his enemies, Quill forges an uneasy truce with Rocket, a gu..
Own Guardians Of The Galaxy Volume 2 - Groot Mug Gift Set from Deff, DVD, Blu-Ray & 4K Video Specialists - Free UK Delivery..
Own Guardians Of The Galaxy - Awesome Mix Vol. 1 Mug from Deff, DVD, Blu-Ray & 4K Video Specialists - Free UK Delivery..
Own Guardians of the Galaxy - I Bite Mug from Deff, DVD, Blu-Ray & 4K Video Specialists - Free UK Delivery..
Own Guardians of the Galaxy - Mix Tape Mug from Deff, DVD, Blu-Ray & 4K Video Specialists - Free UK Delivery..
Own Guardians of the Galaxy - Star Lord Rock Mug from Deff, DVD, Blu-Ray & 4K Video Specialists - Free UK Delivery..
Set to the all-new sonic backdrop of Awesome Mixtape 2, Marvel Studios' Guardians of the Galaxy Vol.2 continues the team's adventures as they traverse the outer reaches of the cosmos. The Guardians must fight to keep their newfound family together as they unravel the mystery of Peter Quill's true parentage. Old foes become new allies and characters from the classic comics come to their aid as the Marvel Cinematic Universe continues to e..
Own Guardians of the Galaxy 2 - Action Mug from Deff, DVD, Blu-Ray & 4K Video Specialists - Free UK Delivery..
Own Guardians of the Galaxy 2 - Angry Groot Mug from Deff, DVD, Blu-Ray & 4K Video Specialists - Free UK Delivery..
From Marvel, the studio that launched the epic franchises of Marvel's Iron Man, Marvel's Thor, Marvel's Captain America and Marvel's The Avengers Assemble, comes an unlikely team – the Guardians of the Galaxy. The Marvel Cinematic Universe expands into the cosmos when brash adventurer Peter Quill steals a coveted orb and becomes the object of a relentess bounty hunt. To evade his enemies, Quill forges an uneasy truce with Rocket, a gun-..
Own Guardians Of The Galaxy Vol. 2 - Awesome Mix Vol. 2 Mug from Deff, DVD, Blu-Ray & 4K Video Specialists - Free UK Delivery..
Own Guardians Of The Galaxy Vol. 2 - Characters Vol. 2 Mug from Deff, DVD, Blu-Ray & 4K Video Specialists - Free UK Delivery..
Own Guardians Of The Galaxy Vol. 2 - Drax Mug from Deff, DVD, Blu-Ray & 4K Video Specialists - Free UK Delivery..
Own Guardians Of The Galaxy Vol. 2 - Festive Groot Mug from Deff, DVD, Blu-Ray & 4K Video Specialists - Free UK Delivery..
Own Guardians Of The Galaxy Vol. 2 - Get Your Groot On Mug from Deff, DVD, Blu-Ray & 4K Video Specialists - Free UK Delivery..
Own Guardians Of The Galaxy Vol. 2 - Get Your Groot On Travel Mug from Deff, DVD, Blu-Ray & 4K Video Specialists - Free UK Delivery..
Own Guardians Of The Galaxy Vol. 2 - Legendary Outlaw Mug from Deff, DVD, Blu-Ray & 4K Video Specialists - Free UK Delivery..
Own Guardians Of The Galaxy Vol. 2 - Rocket Mug from Deff, DVD, Blu-Ray & 4K Video Specialists - Free UK Delivery..